Hi it's Sandy welcoming you to our July preview. 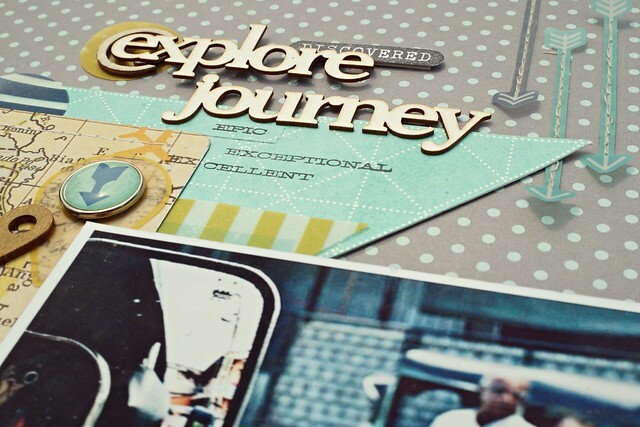 Starting today our designers will be showcasing projects designed with the July Kits. 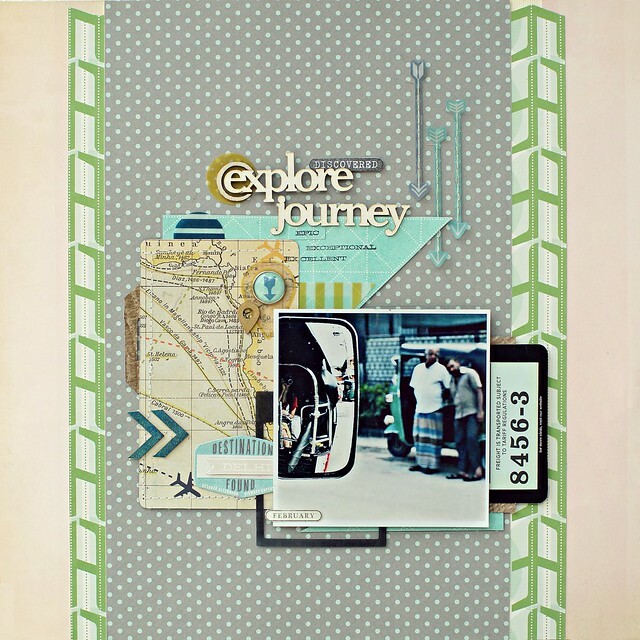 I'm kicking things off with this travel-themed layout featuring papers from the Add-On Kit and embellishments from both the Main Kit and the Embellie Kit. My starting point is this photo taken from a rickshaw in India. It's a busy picture so I print it quite large and put it on a 12"x12" page instead of my usual 8.5"x11" format. I layer pattern papers around the photo forming an L-shape. Then place a triangle 'shelf' on top for my title (chipboard travel words from my stash) to rest on. Since this is a Monday post I have a Simple Strategy to share. When adhering vellum, such as these blue arrows, sewing them on is a great way to avoid glue showing through the paper. Sewing without too much tension in the thread allows you to create an effect of the vellum floating above your page. If you recognise any supplies item on my layout make sure to leave your comments for your chance to win a $5 GC. gorgeous page Sandy! I will definitely have to try sewing through vellum like this, looks beautiful! and the composition is amazing here, love, love, love! You got all of them Sharyn ! Fantastic page Sandy! I too LOVE your design! I really like your page, Sandy! The paper is from October Afternoon's Travel Girl Collection (at least the green side trim is) along with the emphemra and designer brads. The wooden veneers look like Studio Calico. I am so happy to have joined your kit club starting with July's kit. Thank you Sandy for showing me what amazing things I can do with my new box of goodies! The things I recognize are the OA Travel Girl brads and the SC Atlantic cork arrows I believe...Great page! I love it so much! You're right Megan. the short arrows were from last month's kit. i love the way you stitch the arrows! awesome effect! 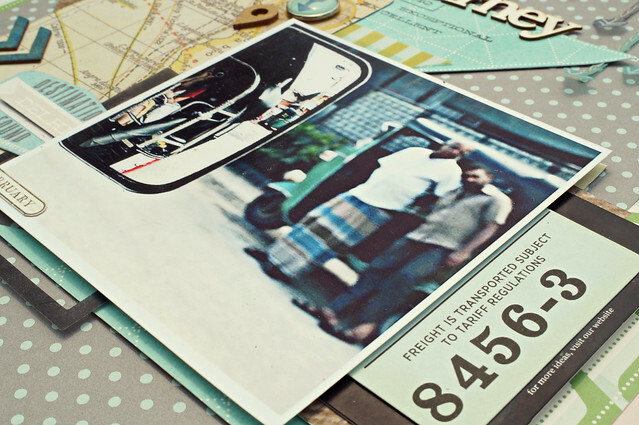 I see some Travel Girl paper! Adorable layout!